(Clearwisdom.net) In May 2004, Illinois Congressman Timothy Johnson wrote a congratulatory letter for the Mid-USA Falun Dafa Experience Sharing Conference. 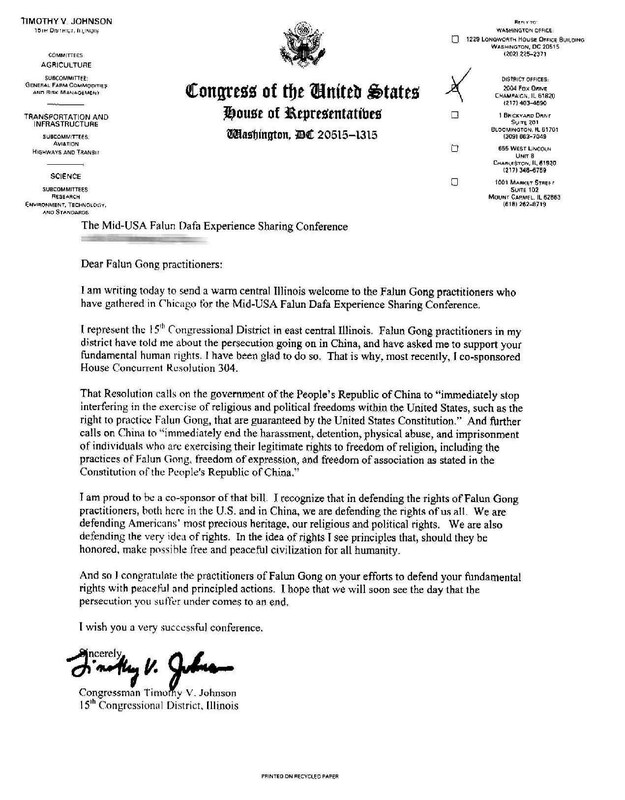 Congressman Johnson said in the letter: "I recognize that in defending the rights of Falun Gong practitioners, both here in the US and in China, we are defending the rights of us all. We are defending Americans' most precious heritage, our religious and political rights. We are also defending the very idea of rights. In the idea of rights I see principles that, should they be honored, make possible free and peaceful civilization for all humanity." "And so I congratulate the practitioners of Falun Gong on your efforts to defend your fundamental rights with peaceful and principled actions. I hope that we will soon see the day that the persecution you suffer under comes to an end."